It’s only natural in a world where viral forms of art and marketing coexist and sometimes collaborate, that we increasingly see these forms intermingling. Two of the most successful practitioners are Shepard Fairey and Jeff Hull. The former's “Obey Giant” campaign spread stickers throughout the country and eventually the world – most often with an image of deceased wrestling icon Andre the Giant branded with the satirically ominous propagandistic slogan “OBEY”. The word was a reference to the cult film They Live (which coincidentally starred a former wrestler who once tussled with Andre). In They Live, OBEY was the subliminal message underlying all ads and media, placed there by nefarious aliens with undue intentions for the future of the planet. Mr. Hull's Games of Nonchalance redefined the genre of Alternate Reality Gaming, offering up a interactive quest involving street and performance art in nearly equal amounts essentially forcing the participant to actively reengage with their local environment and learn the all too true and strange history of San Francisco. These two men's works reexamine the questions posed by history and the very nature of existence in a world over-saturated with media coverage and advertising. The work of a young female Bay Area-based artist, Kari Marboe, seems to fall in this same milieu, working to pose questions and provoke an investigative line of reasoning. Of the six artists on display at Berkeley Art Museum for The 42nd Annual UC Berkeley Master of Fine Arts Graduate Exhibition, I found hers to be the most compelling for further examination. So? Well, one has to enter and exit the museum and be observant to get it. A sort of unintended comment of the strange phenomena of people rapidly, in succession, taking pictures of themselves in front of major works such as the Mona Lisa? This after spending mere seconds considering their camera angles and possibly not much of the art they are peering at! Was he right or wrong? I say half right and I well imagine he would have found Marboe’s work amusing, but not to his taste. In the book, Wolfe, posits a thesis that in the contemporary art world, post-modernism has created a place where theory wins out over craft, leftwing political messages are usually necessary in some shape or form, or in the case of ephemeral works, lack of form. He goes on to put forward the idea that literary narrative has displaced representation. Finally and most relevantly he makes the case that the art market has indeed profited greatly from these changes in the art world. Given that this book came out in 1975, one would well imagine that it has dated poorly. Aside from the over-the-top style and its just to the sarcastic right of Hilton Kramer politics – much of the criticism holds water; that being that the market holds too much sway over the art community and much of contemporary art is indeed literary. A lot of this type of work is cloying and fails at delivering its intended message(s). There are successful practitioners, however. Barbara Kruger and Ed Ruscha are two examples. To each his or her own – Kari Marboe's work won me over. 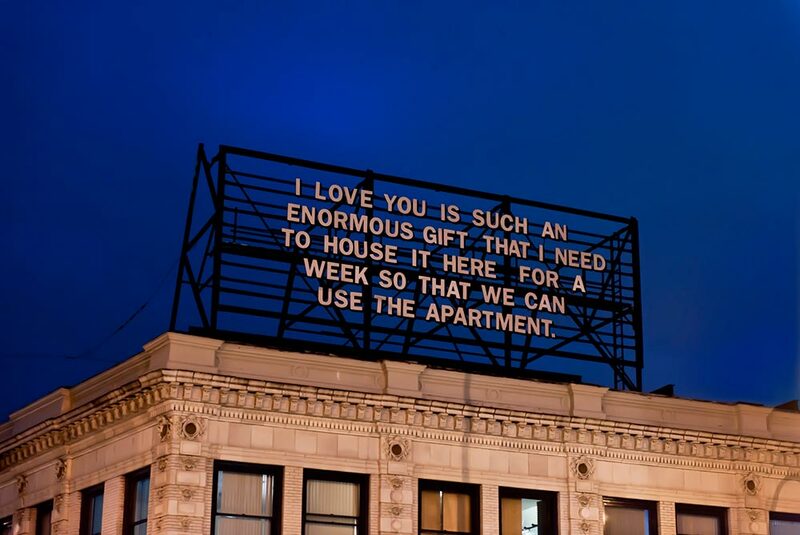 As the artist describes, “Billboard #1 was a one-week installation on top of the Waffle Shop in Pittsburgh, PA that is now shown to others beyond the site as a photograph. The piece is an example of site-specific storytelling where the narrative is closely and forever linked to the site where it is presented in both thematic and physical ways. (printed 4x6’, mounted to acrylic with aluminum backing)"
Marboe goes on to add “The paper weathers so quickly you can tell the oldest individual paper from the newest one.” They are stacked at least a hundred papers thick in columns. — As a freelance journalist, photographer and art critic, Theo Konrad Auer's work has appeared in Pork magazine, Hi Fructose, The Oakbook, The East Bay Monthly, Sweetart Magazine, Juxtapoz, Art Practical and Fecalface Dot Com among many others. Recently he was commissioned to pen an essay for Oakland based nonprofit ProArt's 2x2 Solo program. "I live for engagement and moving the world forward through cultural means."